The second running of the $10k HORSE Championship saw practically no change in attendance from last year when 241 players entered the tournament –this time around 240 players registered for the tournament. As with all mixed-games and $10k Championship events the field was basically made up of poker pros, with a scant few amateurs and unknowns scattered amongst the tables. After a full day of action 170 of the original 240 players managed to survive and bag up their chips for Day 2, including Daniel Negreanu, Barry Greenstein, Eugene Katchalov, Chau Giang, Robert Mizrachi, David Singer, Allen Kessler, John Hennigan, Maria Ho, Mike Matusow, Doyle Brunson, Justin Bonomo, Justin “Boosted J” Smith, Abe Mosseri, Brian Hastings, David Benyamine, Michael Mizrachi, Cole South, John Juanda, Daniel Alaei, Phil Laak, Shaun Deeb, Carlos Mortensen, David Baker, Matt Hawrilenko, Allen Cunningham, Erick Lindgren, Mickey Appleman, Jerry Buss, Chad Brown, Vladimir Shchemelev, Huck Seed, Sorel Mizzi, Scott Seiver, Lyle Berman, Scotty Nguyen, James Bord, Jennifer Harmon, Todd Brunson, and Victor Ramdin. 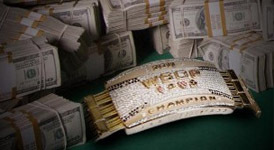 This entry was posted on Wednesday, June 22nd, 2011 at 10:21 am and is filed under Poker News. You can follow any responses to this entry through the RSS 2.0 feed. You can leave a response, or trackback from your own site.